It holds such a majestic spot on the waterfront of Vineyard Haven, and to watch it fall further into disrepair was disappointing — peeling paint, rotting wood, a crumbling artifact. So we were hopeful when the property and the 1895 building were purchased by the Martha’s Vineyard Museum, though we wondered whether the nonprofit would be able to generate enough capital to do the kind of work that would be necessary to return the building to glory. It’s been fun to watch the transformation from the bottom of the hill. Large windows offer a spectacular, panoramic view of Vineyard Haven Harbor. 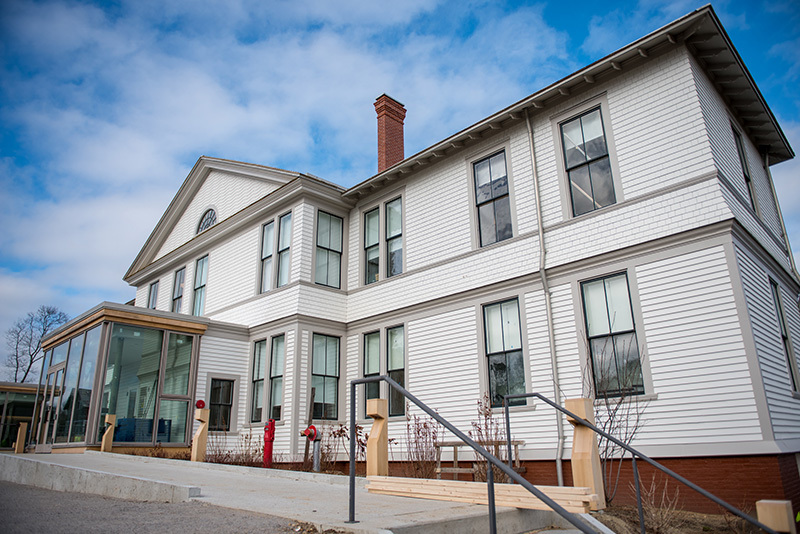 Those same windows provide brilliant natural light inside that brings the museum’s extraordinary exhibits to life — the original Fresnel lens from the Gay Head Lighthouse, a shining beacon at the center of it all. We were also taken by the blend of old and new. Throughout the museum there are engaging interactive screens that provide background information on the Island and the exhibits before you. You might be surprised, as we were, to learn that Martha’s Vineyard was once the home of 60 dairy farms that all sent their product to a cooperative. There’s a door from a fishing shack that was used on Chappaquiddick and later moved to Edgartown Harbor, that provides a glimpse into the Island’s unpredictable and sometimes extreme weather. It’s recorded in the handwriting of Islanders, fading like so many memories do as we age. Kids might wonder what that ancient form of writing is. (It’s cursive.) Perhaps this door was at the Edgartown location, too, and we just missed it on one of our many visits. That’s one of the impressive things about the new space: how much room it provides for the collection to breathe — and grow. On a board near the fishing shack door, the museum invites visitors to share their own weather memories on Post-it notes. We were intrigued by the person who wrote that he or she remembers the ’38 hurricane. Alongside an extensive display of the Island’s shipwrecks (the map gives you a sense of just how relentless the weather and sea is around the Island), there is a children’s area that allows them to get their hands on history in a fun way. And it’s designed with parents in mind, because you can easily see inside through the glass wall. The museum’s cafe is located next to the Fresnel lens, and its tables offer a view through those windows. We saw one woman, bathed in sunlight, sipping from a coffee cup and staring out as a Steamship Authority ferry left the slip on its voyage to Woods Hole. We wonder if she lingered there until the next ferry arrived, captivated by the brilliant sunlight and the deep blue of the cloudless sky. You should stop by and see for yourself, and buy an annual membership (just $40 for Islanders). You won’t be disappointed.